Update: D1 plc may be called Neos Resources plc now. After a short partnership with BP around 2009 they split up and it seems they renamed to Neos. Neos seems to be dissolved. There was also a problem with jatropha propagated by seed in India where the trees did not produce as much oil as before. In countries such as South Africa, there is an outright ban on jatropha. So... DO YOUR OWN DUE DILIGANCE! 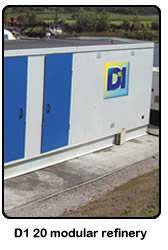 D1's modular biodiesel processor, the D1 20, is designed to produce 8,000 tonnes per year of biodiesel, or 22,000 litres per day with 90% utilisation. The D1 20 is both designed and built in the UK. The result of several years of research and development, the D1 20 employs proprietary systems for biodiesel production.